Clothing/Jewelry Description Furs and $25,000 worth of jewelry, including a diamond-encrusted bracelet, two diamond rings and a diamond breastpin. Distinguishing Characteristics Caucasian female. Black hair, black eyes. Boomhower is short and has a heavy build. Boomhower was last heard from when she spoke to a friend by telephone from her home in the 700 block of Nimes Road in Los Angeles, California on August 18, 1949. The friend called her between 7:00 and 8:00 p.m. After the conversation was over, Boomhower changed clothes, leaving the old dress on her bed, and left her home. She left her 1941 sedan locked and parked in the garage, an uneaten salad on the dining room table, and all the lights turned on. She has never been heard from again. She had many social engagements scheduled for the week of her disappearance and missed them all without notifying anyone, which is uncharacteristic of her. Prior to her disappearance, Boomhower had told a friend she couldn't come over for dinner on the night of the 18th because "something has come up," and she told her business manager she was going to meet a man that night. She didn't say who she was meeting, or where, or why. Investigators determined she had probably disappeared sometime between 8:00 and 8:45 p.m. Her conversation with her friend was over at 8:00, and she had promised to call her business manager at 8:30, but never did. Because she lived alone and her friends initially thought she'd just left on a trip, her disappearance wasn't reported for several days. According to Boomhower's gardener, for about a week prior to her disappearance, a middle-aged man with white hair sat in an expensive car in the next driveway and watched her house. This man has never been identified and it's unclear whether he had anything to do with her case. A few days before she went missing, Boomhower spoke to her furrier and said she couldn't place an order yet because she had to discuss it with her husband. She then corrected herself and said she needed to discuss it with her family. Her furrier found these comments strange, because Boomhower's husband had been dead for years and her closest relative was a sister who lived in New York. Investigators looked into the theory that Boomhower had eloped, but they could find no evidence to support it; she didn't seem interested in getting remarried and none of her family or friends thought she would have left without telling anyone. 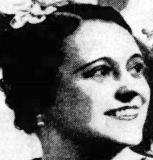 Boomhower's white calfskin handbag was found in a telephone booth at a supermarket on Wilshire Boulevard in Los Angeles on August 25, a week after she disappeared. On the side of the purse someone had written a message in ink: "Police Dept. - we found this at beach Thursday night." Thursday was the day of Boomhower's disappearance. The purse contained a credit card, Boomhower's driver's license, her car and house keys, her compact and her lipstick. There no evidence that the purse had been exposed to sand or water. This was the last known trace of Boomhower. Boomhower disappeared the day before the sixth anniversary of the death of her husband, a linoleum tycoon and big game hunter. Because of the timing, authorities looked into the possibility that she had taken her own life. They could find no evidence to support this theory. Boomhower is described as a very social, fun-loving woman. She gave the appearance of a wealthy individual, but in fact she was having financial problems at the time of her disappearance. She had pawned her watch, was considering pawning some jewelry, and was trying to sell her furniture and late husband's big game trophies at a fraction of their value. She'd also taken out a $5,000 home equity loan and additional loans. She had put her house on the market earlier that year and was willing to sell it at a loss. However, her attorney stated she was not bankrupt and she was not depressed about her financial issues. A judge declared Boomhower legally dead just eleven days after her disappearance; California state law usually required a person to be missing at least ninety days, but judge waived this rule so Boomhower's attorney could administer her estate. In November 1949, however, the judge reversed his ruling. Boomhower was eventually declared legally dead a second time seven years after her disappearance; by then, debts and legal fees had reduced her estate's value by more than two-thirds. Updated 5 times since October 12, 2004. Last updated May 1, 2017; two pictures added, distinguishing characteristics, clothing/jewelry description and details of disappearance updated.